This picture was taken at the Transportation Museum. The boys were sitting on an old trolley from the 50s. A train went by outside and Reid got scared. So Cort had to step in. Have I mentioned lately how much I love having twins? This was my first attempt to use Picnik to do some "fun" editing. Linking up today with Your Sunday Best over at A Rural Journal. Happy Birthday! Hope the guys spoil you rotten! I think that picture is the cutest ever. I am so glad they have each other. Happy Birthday! How about Happy Birthday? Love the picture too. I did Photoshop Lesson #4 on Abraham Lincoln's Blog. Not sure you are interested as you are already using Picnik. Happy Birthday, cute pic of the boys! Awww, poor li'l guy. Glad Cort was there to help him out! 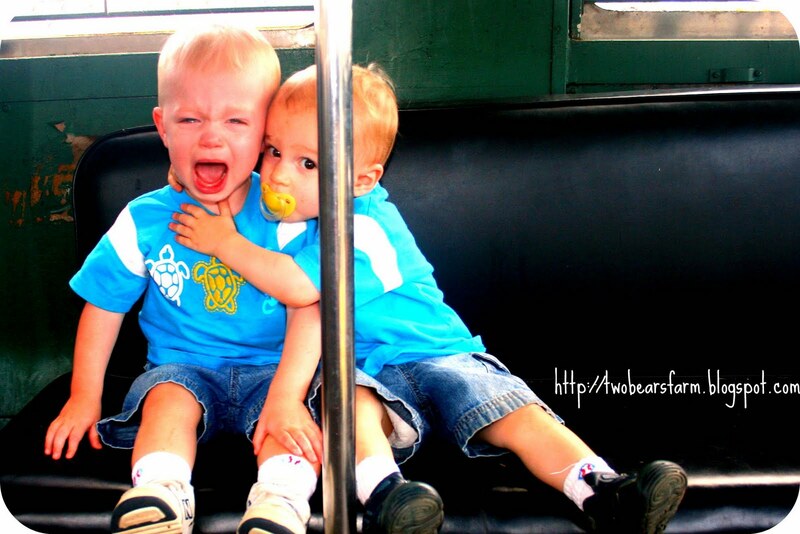 Now that is just sweet..."here brother I will hug you its okay" to cute! and before you know it, you will say its the 46 LOL that is where I am. Zoom time flies. All three of your boys are so cute-your picture today is priceless!! This picture is priceless! HAPPY, HAPPY Birthday, Lisa. I hope you have a wonderful day! Awwwwww. Email this picture to me pleeeeeze :-) At my verizon email. Awwww, now that photo is indeed worth a thousand words. Adorable and sweet! I love using picnik, isn't it fun?! Happy Birthday, Momma! Oh, to be 36again. Oh, scratch that. I was not in my right mind back then! But that's another show, as Oprah would say. First, I think you did great on the photo editing. Did you enjoy it? Two of Jackson's good friends are twin girls...age 4. We were together on Wednesday and one fell pretty hard. I think her twin cried even harder for her because she was worried about her and the mention of her going to the hospital. It was the sweetest thing ever. Oh ,that is precious!What a good brother! This has to be the cutest picture I have ever SEEN!!!!! Even with his paci, he is still comforting his brother! It really needs framed and put somewhere. Hey, did you hear about the new big butterfly exhibit at Natural Bridge? They get hundreds of new ones each week, and have a rare African blue one. It is an almost 2,000 foot habitat with a waterfall and pond plus a farmhouse facade where you can watch them transform. It is right down by the toy museum. I think you are maybe closer to there than we are, not sure. I guess it is your birthday - happy birthday - those boys are just so sweet! Well, happy 36th Birthday - another June Baby ;-) Mine was the 16th, but I wish I were 36 again! Have a wonderful day with your boys! That photo is so adorable with one comforting the other...very sweet! Oh they look adorable! This is such a sweet picture and you did an excellent job editing it!! Also Hope you had a wonderfully blessed birthday!! Happy Birthday! I've always heard of that amazing bond between twins. What a gift! What a sweet moment to capture. Happy Birthday! Happy Birthday!!! That is such a cute pic!!! Twins are awesome!!! Happy Birthday!!! That picture is adorable!! haha! You know that picture can be viewed in two ways: adoration or strangulation! Super cute! Oh my gosh, LOVE it!! This is a precious photo of the twins. It's so cute how you captured the tenderness and closeness of twins. Love it! Love that picture! The boys are too cute! Happy Birthday!! I'll be joining you on the 4th. They are sweet! I love to use picnik. Their features are a lot of fun to play around with. Your shot turned out great. Oh my gosh I adore this photo. It speaks more than a thousand words. It looks perfect! I love it and the editing looks great! Yay!! Remind me to send you my other blog link and you can see me play w/loads of picnick stuff, too! So sweet : ) My twins were like that-and actually they still are-even as teenagers they comfort one another! hahaha hoooooooo that looks pretty scared to me yes! AND VAN HARTE GEFELICITEERD MET JE VERJAARDAG!!! and yes this is happy birthday in Dutch!!! Oh my goodness! I melted when I looked at this picture. SO sweet! And Yahoo for your Birthday....I saw it on facebook...but I will say it again...and I hope you had a wonderful day!! My training is going ok. I thought of you today...I used one of the packets you sent me- think it was the Almond/honey....so good. Hope you're having a really super day/evening. Boy I have a lot of catching up to do!!! !